Posted by Dave Emory ⋅ May 25, 2014Post a comment Email This Post Print This Post Tweet This! This description contains material not included in the original broadcast. Introduction: Bringing our coverage of the crisis in Ukraine up to date, we begin by detailing some of the political and economic dynamics surrounding the statement that Ukraine has 25% of the world’s proven natural gas reserves. CORRECTION: The CNBC story containing this statement appears to be in error. Ukraine does indeed have huge natural gas deposits, but they do not appear to be a quarter of the world’s reserves. The deposits may be roughly a quarter of the natural gas deposits in Europe. In addition to the recruitment of well-connected Americans to assist in the development of Ukrainian fossil fuel resources, the crisis is spurring action by the EU aimed at countering European dependence on Russian natural gas. Not surprisingly, some of the Nazi cadre recruited into the Ukrainian national security forces have burned people alive in both Odessa and Mariopol. There are indications that elements of both American and German intelligence may be assisting the Ukrainian neo-Nazi forces. German media are functioning in a manner similar to their American counterparts, providing something of a Trans-Atlantic Ministry of Truth. Swoboda’s street fighting cadre “Combat 14” and their ideological affiliation with David Lane of The Order. The Reagan administration’s hiring of OUN/B propagandists to broadcast on Radio Liberty in the 1980’s. The misreporting of a German “OSCE” mission, deliberately ignoring the group’s operations on behalf of the Bundeswehr. The apparent involvement of American mercenaries in the violence in the Eastern Ukraine. The Ukraine’s issue of 1 billion dollars worth of bonds, guaranteed by the U.S. taxpayer. Ukrainian President Viktor Yuschenko’s appointment of a New York-based OUN/B supporter and Yaroslav Stetsko’s former secretary–Roman Zvarych [also Zavrych]–to be Minister of Justice. New Ukrainian President Petro Poroshenko’s recreation of the old Yuschenko political team, including former Yuschenko Minister of Justice Roman Svarych. 1a. Applying the time-honored adage of following the money works in Ukraine. We have noted in posts and programs that Ukraine has 25% of the world’s proven natural gas reserves. The Eastern part of the country is richer in natural gas than the West. A map at right shows the dis­pro­por­tion­ate num­ber of gas fields in the east­ern half of Ukraine. In the hotly-contested area around Sloviansk, Shell has a contract to develop shale gas. Exemplifying the very crony capitalism that the U.S. decries when it occurs elsewhere (including Russia), Burisma–a Cyprus-based company with significant investments in Ukrainian natural gas fields –has hired Vice President Joe Biden’s son R. Hunter Biden. The company’s board of directors features Devon Archer, the former college roommate of Secretary of State John Kerry’s Stepson Christopher Heinz (of the wealthy food-empire family. Put THAT on your hamburger!) Archer was national co-finance chair of Kerry’s Presidential campaign in 2004. Ukraine has issued $1 billion bonds, backed by the U.S. taxpayer. The bonds were guaranteed through the U.S. Agency for International Development, which was involved with channeling money to finance the coup in Ukraine. “Why Did an Energy Firm with Big Assets in Ukraine Hire Joe Biden’s Son?” by Olivia Knox and Meredith Shiner; Yahoo News; 5/14/2014. In the span of a few weeks, an energy firm little-known inside the United States added two members to its board of directors — scoring connections to Secretary of State John Kerry and Vice President Joe Biden in the bargain. On April 22, Cyprus-based Burisma announced that financier Devon Archer had joined its board. Archer, who shared a room in college with Kerry’s stepson, Christopher Heinz, served as national finance co-chair for the former senator’s 2004 presidential campaign. Then, on Monday, the firm announced that Biden’s younger son, R. Hunter Biden, would join the board of directors. Why would the company, which bills itself as Ukraine’s largest private gas producer, need such powerful friends in Washington? The answer might be the company’s holdings in Ukraine. They include, according to the firm’s website, permits to explore in the Dnieper-Donets Basin in the country’s eastern regions, home to an armed pro-Russian separatist movement. They also include permits to explore in the Azov-Kuban Basin of the strategic Crimean peninsula, annexed earlier this year by Moscow. . . .
1b. The EU is pressuring Obama and the U.S. to expand fracking and offshore drilling, in order to permit more fossil fuel exports to Europe. The hope is that this will free Europe up from energy dependence on Russia. “Read The Secret Trade Memo Call­ing For More Frack­ing and Off­shore Drilling” by Zach Carter and Kate Sheppard; The Huff­in­g­ton Post; 5/19/2014. The Euro­pean Union is press­ing the Obama admin­is­tra­tion to expand U.S. frack­ing, off­shore oil drilling and nat­ural gas explo­ration under the terms of a secret nego­ti­a­tion textobtained by The Huff­in­g­ton Post. The con­tro­ver­sial doc­u­ment is an early draft of energy poli­cies that EU nego­tia­tors hope to see adopted under the Transat­lantic Trade and Invest­ment Part­ner­ship (TTIP) trade deal, which is cur­rently being nego­ti­ated. The text was shared with Amer­i­can offi­cials in Sep­tem­ber. The Office of the U.S. Trade Rep­re­sen­ta­tive declined to com­ment on the document. . . .
. . . . There has also been an increas­ing push to loosen con­straints on nat­ural gas exports from the U.S. to Europe, par­tic­u­larly as the con­flict between Rus­sia and the Ukraine has grown, high­light­ing Europe’s depen­dency on Russ­ian energy. Although burn­ing nat­ural gas pro­duces lower emis­sions than oil or coal, the energy-intensive stor­age and ship­ping process — liq­ue­fy­ing the gas and then send­ing it in fuel-burning ves­sels — elim­i­nates many of its advan­tages. And crit­ics of gas say that increas­ing exports would only increase reliance on fos­sil fuels, rather than speed­ing the tran­si­tion to renew­ables. It would also likely increase energy prices in the U.S., although the effects of the deal would not come to fruition for sev­eral years. Free trade agree­ments fre­quently bind all of their par­tic­i­pants to a spe­cific reg­u­la­tory regime, hin­der­ing the deploy­ment of future reg­u­la­tions in response to new prob­lems. Trade pacts are enforced by inter­na­tional courts, which can issue eco­nomic sanc­tions against coun­tries that vio­late the deals. The pro­posed EU lan­guage would run counter to exist­ing envi­ron­men­tal stan­dards that limit the devel­op­ment of the fos­sil fuel indus­try. . . .
1c. The crisis in Ukraine has prompted discussion of an EU Energy Union. “UPDATE 1-Merkel Tells Putin Rus­sia Has not Done Enough to Ease Ukraine Crisis” by Alexandra Hudson and Erik Kirschbaum; Reuters; 4/25/2014. Germany’s Angela Merkel said on Fri­day that she had told Russ­ian Pres­i­dent Vladimir Putin by tele­phone that Moscow had not done enough to urge sep­a­ratists in Ukraine to dis­arm, and that fur­ther sanc­tions against Rus­sia must be contemplated. The Euro­pean Union and Group of Seven (G7) nations would con­sider sanc­tions “within the frame­work of the sec­ond stage of sanc­tions” she said at a news con­fer­ence in Berlin with Poland’s Prime Min­is­ter Don­ald Tusk, refer­ring to a three-stage scheme. The sec­ond stage of sanc­tions com­prises over­seas asset freezes and visa bans on those Rus­sians and Ukraini­ans con­sid­ered respon­si­ble for the esca­la­tion. Dozens of indi­vid­u­als are already on the list. Stage three, under prepa­ra­tion, would involve trade and eco­nomic sanc­tions against Moscow. Under the terms of the deal Rus­sia, the United States, Ukraine and the EU agreed to work to dis­arm ille­gal groups. “Rus­sia has the power, or could have the power, to bring the sep­a­ratists on to a peace­ful path of dis­cus­sions about the con­sti­tu­tion and prepa­ra­tions for elec­tions, but such sig­nals are unfor­tu­nately lack­ing,” Merkel said. Poland’s Tusk warned: “The cri­sis in Ukraine may become per­ma­nent, which could require a new east­ern pol­icy from Europe”. He added he could not imag­ine Europe stick­ing to a “business-as-usual” position. Tusk has urged the EU to cre­ate an energy union to secure its gas sup­ply and weaken its cur­rent depen­dence on Russ­ian gas. Jean-Claude Juncker, a can­di­date for Euro­pean Com­mis­sion pres­i­dent, was quoted by Pol­ish state agency PAP on Fri­day as say­ing that the energy union pro­posal was “an intel­li­gent and wise proposal”. Merkel said she sup­ported the idea in prin­ci­ple but the details would need to be worked out and a joint mar­ket and joint struc­ture was necessary. 2. Ukraine has issued $1 billion bonds, backed by the U.S. taxpayer. The bonds were guaranteed through the U.S. Agency for International Development, which was involved with channeling money to finance the coup in Ukraine. “Ukraine Just Issued $1 Billion Bonds Backed by The US Taxpayer” by Tyler Durden; zerohedge.com; 5/14/2014. “The $1 billion loan guarantee that (U.S. Agency for International Development) will implement will help the government of Ukraine access capital at reasonable rates and manage the transition to a prosperous democracy,” Mark Feierstein, assistant administrator at USAID, said in April. The deal follows similar guarantees provided for bonds issued by Tunisia in 2012 and Jordan last year. Bank of America Merrill Lynch said Tuesday that Ukraine’s bondholders could face losses if separatists in the country’s southeastern regions successfully gain independence. The bank said a breakup of the country could potentially force the International Monetary Fund to tear up Ukraine’s current $17 billion aid package and trigger a debt restructuring program that would hit private investors. An IMF spokesperson said the fund is monitoring the situation. 3. In FTR #781, we noted that when Viktor Yuschenko was president of the Ukraine (after the so-called Orange Revolution), he instituted an Orwellian re-write of history, exhalting the OUN/B as “anti-fascists” and heroes. At the time, Yuschenko was married to the format Ykaterina Chumachenko, an OUN/B official and Deputy Director of Presidential Liaison under Ronald Reagan. Yuschenko also appointed Roman Zavrych [also Zvarych], Yaroslav Stetsko’s former secretary as Minister of Justice. Zavrych, like the former Ms. Chumachenko was an American-based OUN/B disciple. He was born in Yonkers, New York.
. . . .In the 1980s, Yushchenko’s wife Kateryna had been active in Ukrainian right-wing emigré circles. She had worked with Stetsko as an assistant, and is a true believer of these narratives. In 2005, Yushchenko had also appointed a New York Banderite (and Stetsko’s former secretary), Roman Zavrych [also Zvarych], to be Minister of Justice. Zavrych was later fired for having lied about having a PhD from Columbia University. . . .
4. Noting that the provisional government there is directly evolved from the OUN/B Ukrainian Nazi administration and military apparatus of World War II, we have observed that the utter perversion of political and historical reality by our media is worthy of George Orwell’s 1984. The acting president of the coup regime in Kiev announces that he is ordering an “anti-terrorist” operation against pro-Russian protesters in eastern Ukraine, while his national security chief says he has dispatched right-wing ultranationalist fighters who spearheaded the Feb. 22 coup that ousted elected President Viktor Yanukovych. 5. Robert Parry has posted another useful story on the Ukrainian crisis. Noting the OUN/B heritage of Swoboda and Pravy Sektor in the current Ukrainian government, he correlates that Nazi heritage with the lethal firebombing of pro-Russian demonstrators in the Black Sea port city of Odessa. In addition, Parry notes an OUN/B involvement with the Reagan administration’s U.S. Information Agency and Radio Liberty, coloring broadcasts in the 1980’s in a pro-Nazi fashion. In FTR #’s 777, 778, we went into much greater depth, noting the evolution of the OUN/B and the overlapping Gehlen spy outfit and Anti-Bolshevik Bloc of Nations. We chronicled the CIA/OPC sponsorship of OUN/B guerilla cadres formed by the Third Reich and perpetuating their combat into the early 1950’s. OUN/B elements figured in the assassination of JFK. OUN/B evolved through their inclusion in the Crusade for Freedom, and became an important element of the GOP and the Reagan administration. Along with other elements of the Anti-Bolshevik Bloc of Nations, the OUN/B was centrally involved with the destabilization of the Soviet Union and Eastern Europe through the Free Congress Foundation. That is the sad, tragic background to the current conflagration. “Ukraine’s ‘Dr. Strangelove’ Reality” by Robert Parry; Consortiumnews.com; 5/5/2014. 6a. For a second time, pro-Russian seperatist protesters in Ukraine have been burned alive by neo-Nazi recruits from the Ukrainian National Guard. As we have seen in the programs listed above, as well as in numerous posts, the interim Ukrainian government’s key ministries–defense, judiciary and education among them–are dominated by Swoboda. Another fascist descendant of the OUN/B–Pravy Sektor–also participates in the government, the defense ministry in particular. That these groups, apparently supported by intel elements from the U.S. and [probably] Germany, should behave in such a manner is no surprise. In addition to their open admiration for SS and Gestapo units from World War II, they manifest the ideology and slogans of neo-Nazis worldwide. NEVER lose sight of the fact that Lane and company were inspired by The Turner Diaries, published by The National Alliance. Glenn Greenwald spent a big chunk of his professional career defending Nazi organiztions, including the National Alliance. He worked tirelessly to defend them from civil litigation that might arrise from the victims of acts incited by books such as Hunter and Turner Diaries. 6b. As discussed in FTR #780, Swoboda maintains a street-fighting cadre called Combat 14. “The Kiev Esca­la­tion Strat­egy”; german-foreign-policy.com; 3/06/2014. . . . . On the other hand, this should draw atten­tion because Svo­boda hon­ors Nazi col­lab­o­ra­tor, Stepan Ban­dera and his Orga­ni­za­tion of Ukrain­ian Nation­al­ists (OUN), respon­si­ble for hav­ing com­mit­ted mas­sacres par­tic­u­larly of Jew­ish Ukraini­ans and Poles. Svo­boda, accord­ing to activists in Kiev, still dis­poses of an ille­gal armed wing known as “C14.“ This has been con­firmed a few days ago by the BBC, which reports “C14’s” size allegedly at 200 mem­bers — and took over the head­quar­ters of the Com­mu­nist Party, an act that turns the spot­light on the con­cept of rule of law applied now in the pro-Western Ukraine. The name “C14” (“Com­bat 14″) is prob­a­bly a seman­tic flirt with the name “C18” (“Com­bat 18″) one of the inter­na­tional net­works of neo-Nazi ter­ror­ist orga­ni­za­tions, with which the “C14,” of course, shares no orga­ni­za­tional ties. At the same time, the name points to the num­ber “14.” In fas­cist cir­cles this refers to the “four­teen word” slo­gans of com­mit­ment to the “white race.” As the leader of Svoboda’s ally “C14” explained, his orga­ni­za­tion is in a “strug­gle” with “eth­nic groups” that are wield­ing, among other things, “eco­nomic and polit­i­cal power.” The “eth­nic groups” he is refer­ring to are “Rus­sians and Jews.“ . . . .
. . . . Neo-Nazi activist April Gaede, a Kalispell, Mont., resident who corresponded frequently with Lane, announced with great fanfare that she and “the gals from WAU [Women For Aryan Unity]” had established a David Lane Memorial Fund to cover the expenses of interring Lane’s remains. According to Gaede, Lane told her that he wanted to be cremated and have his ashes placed in the capstone of a pyramid monument. However, Gaede wrote on the racist online forum Stormfront, “Since we are not in a situation to build a monument in a White homeland,” Gaede was arranging to instead distribute Lane’s ashes among 14 smaller, portable pyramids, which would then be enshrined in the homes of 14 white nationalist women. (The number of pyramids is a direct reference to “the 14 words,” the white nationalist catchphrase authored by Lane: “We must secure the existence of our people and a future for white children.”) . . . .
Notes the presence of Pravy Sektor OUN/B heirs in the firebomb massacre in Odessa, as well as that in Mariopol. Further develops the continuity between the interim government in Ukraine and the OUN/B regime of Yaroslav and Slava Stetsko. As discussed in FTR #779, Stetsko meet with Ronald Reagan during the latter’s administration. Reagan stressed the common goals of his administration and Stetsko. Underscores the solidifying of the relationship between the Pravy Sektor storm troopers and the Ukrainian national security cadres. 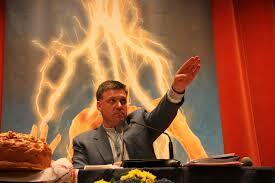 Further develops the relationship between Pravy Sektor and other European Nazi groups. Maintains that some 400 members of “Academi” (formerly Blackwater) are assisting the Ukrainian forces in Eastern Ukraine. “Fascist Freedom Fighters”; German-Foreign-Policy.com; 5/12/2014. The reinforcement of fascist forces in Ukraine, under the aegis of the putsch regime in Kiev, is having repercussions on its German supporters. The commemoration of a Ukrainian supporter of the Holocaust has ignited a debate in Munich. The “question” is being raised in the press, whether the commemoration of “a fascist freedom fighter”[sic!] should be publicly honored. Kiev’s Minister of Education, a graduate of Munich’s “Ukrainian Free University,” takes up the defense of the supporter of the Holocaust in the German media. The fascist “Pravy Sektor” (“Right Sektor”) militia is intensifying its relations with rightwing extremists in several European countries, including Germany. The organization that had participated in the Odessa Massacre has ties to violence-prone neo-Nazis in Sweden as well as to Germany’s NPD. Whereas the leader of this organization insists he is working closely with Ukraine’s official repressive authorities, the media is reporting that these authorities are also supported in their brutal repressive measures (“anti-terror operations”) against the insurgents in Eastern and Southern Ukraine by the CIA and FBI. Evidence of a BND involvement remains unconfirmed. Should a Fascist be Commemorated? The “Süddeutsche Zeitung’s” article indicates that the OUN and its leaders, such as Stetsko, are not only widely acclaimed in Ukrainian organizations in Germany, but also within the putsch regime in Kiev, even among ministers, who are not in the notorious Svoboda Party. As evidence, the article quotes Serhiy Kvit, “Minister of Education” in the putsch regime. Kvit calls Stetsko’s autobiography, containing his plea for adaptation of the “German methods of Jewish extermination,” a “counterfeit document,” alleging that the OUN, whose activists had participated in a considerable number of massacres of Jews, “had nothing to do” with anti-Semitism. Kvit had been active in the 90s in extremist rightwing organizations, for example, in the “Congress of Ukrainian Nationalists” (CUN), a fascist conglomerate, organized in part by Stetsko’s widow, Yaroslava. Yaroslava, who had been a UPA member, had worked alongside her husband in their Munich exile, and has also been honored in Munich with a commemorative plaque. (german-foreign-policy.com reported.) Kvit later embarked on a scholarly career. In 2001, he received his PhD at Munich’s “Ukrainian Free University,” where OUN veterans had been active for a long time, and in 2007, was named President of the Kiev Mohyla Academy National University, until he was recently named “Minister of Education” in the putsch regime. Two years ago, Kvit, for example, helped create a confrontation with Grzhegorz Rossolinski-Liebe, a historian from Berlin. Rossolinski-Liebe, the author of a dissertation on OUN leader, Stepan Bandera, scheduled to be published this fall, had been invited to Ukraine for a speaking tour, in early 2012. Six talks were on the schedule – two in Lviv, two in Dnipropetrovsk and two in Kiev. There were protests against Rossolinski-Liebe because of his being a known Bandera critic. In Lviv, the organizers were unable to acquire a venue, reported the historian later. Of the four other speaking engagements, three had been cancelled on short notice. Some of the cancelations had been directly traceable to interventions made by the Svoboda Party, because of his criticism of Bandera. Whoever expresses such criticism is considered – at least in the West, and even in some regions of Central Ukraine – “an enemy of Ukraine or a traitor.” One university professor confirmed to him that “in Ukraine, historians cannot openly speak about history.” In response to his suggestion that a memorial be erected to the victims of the Lviv Pogroms of 1918 and 1941, “scholars from Lviv … said he was crazy.” Even the president of the Kiev Mohyla Academy National University, at the time, Serhiy Kvit, angrily attacked him and refused him the possibility to deliver his talk. Kvit is considered a follower of the publicist Dmytro Dontsov, who is credited with the creation of an “indigenous Ukrainian fascism.” Dontsov had translated Hitler, Mussolini and others into Ukrainian. From Rossolinski-Liebe’s report, one learns also that the German Embassy in Kiev was completely cognizant of the situation – and therefore knew also about the dramatic growth in influence of Ukraine’s Bandera followers. When he received a telephone call from a man, identifying himself as a militiaman, saying he would drop by, Rossolinski-Liebe says that “the German Embassy … made arrangements for me to move into an apartment of an embassy employee, where I would be safe.” Of the six scheduled lectures, he was only able to hold the lecture in the German Embassy, “under militia protection” – “about 100 Svoboda followers were demonstrating outside.” Nearly two years later, to the day, German Foreign Minister Frank-Walter Steinmeier (SPD) invited Oleh Tiahnybok, the leader of Svoboda, to the German Embassy in Kiev for talks. One result – Svoboda is now represented in the putsch regime. Many of the Pravy Sektor activists, who participated in the May 2, Odessa Massacre and the May 9, massacre in Mariupol had come from the ultra-nationalistically charged milieus, particularly those in West Ukraine. The armed organization, playing a major role in overthrowing the Yanukovich government, originated as an alliance of rightwing extremist groups. In the meantime, it has developed good contacts to numerous extremist rightwing associations throughout Europe. Pravy Sektor’s press attaché, Olena Semenyaka, reported that she could not attend the March 22 Young National Democrates’s (JN) “Europe Congress” of the German NPD’s youth association, in Thuringia, only because of a conflict with other scheduled engagements. The Swedish Nordisk Ungdom neo-Nazi organization, which, according to Semenyaka, financially supports the Pravy Sektor, had attended the NPD congress, along with the Svenskamas Party, some of whose activists had also participated in the violent Maidan riots. In March, one of those Maidan participants stabbed a leftist in Malmo, soon after returning from Kiev. Charged with attempted murder, he has been on the run since. Recently, Semenyaka gave an interview to the NPD party’s “Deutsche Stimme” journal. In the course of her interview, she boasted that at the Maidan, “ultra-nationalists” became transformed into “national heroes.” The Pravy Sektor is a “great partisan movement,” she boasted. Meanwhile, German forces further to the right than the NPD are showing a growing interest in the Pravy Sektor. In April, the ultra-right online platform “Blaue Narzisse” (Blue Daffodil) published an interview with Olena Semenyaka. She emphasized that “even modern Nazi sympathizers will find their place in our broad ranks” and explained that the Pravy Sektor’s most important current task is to “liberate” Ukraine “from collaborators, separatists and marionettes of Russia and the West.” As a matter of principle, the Pravy Sektor coordinates its operations with the respective Ukrainian authorities, according to its leader Dmitro Yarosh. “Our battalions are integrated into the new territorial defense,” explains Yarosh. “We have very close contacts to the secret service and the military staff. We really have good relations with everyone, except the police.” Yarosh had already been closely cooperating with the head of the National Security Council Andriy Parubiy to overthrow the Yanukovych government. Parubiy, a leader of the extreme right in the 1990s, was considered, last winter, the “commander of the Maidan.” Today, he is organizing the regime’s “anti-terror missions” in Eastern and Southern Ukraine. US specialists from the CIA and FBI are serving as “advisors” and – according to reports – 400 elite soldiers from the US mercenary company “Academi” (formerly “Blackwater”) are providing operational support. It is not yet clear, whether the BND is also involved in the Ukrainian “anti-terror mission.” However, what is known, is that the German military observers, who had been held in Slavyansk in late April, were in contact with the BND. The German government is refusing any further information. 8. Among the stories blacked out in the U.S. (and most of the West) is the true nature of some personnel detained in the Eastern Ukraine. Widely reported to be “observers” from the OSCE, they were, in fact, Bundeswehr advisers. “An Unusual Mission;” german-foreign-policy.com; 4/28/2014. Many contradictions have appeared over the case of the captured German military observers in Slavyansk. Contrary to persisting misinformation, a leading OSCE functionary has confirmed that the military observers were not on an OSCE mission in the Ukraine, but rather on a German Bundeswehr mission at the request of the putsch regime in Kiev. Even before the incident in Slavyansk, the Bundeswehr considered the activities of this partisan unit – which officially claims to be acting on the authority of “the Vienna Document” arms control agreement – to be “unusual” and “unprecedented in this form.” In fact, the Bundeswehr personnel were not only involved in a dangerous conflict; they were also engaged on the territory of a successor state of the Soviet Union. To maintain the military balance in Europe, the West had once promised Moscow not to station any military in these countries. Last week, one of the detained Germans had publicly declared that his delegation was exclusively monitoring Ukrainian security forces; their mission statement did not allow anything else. The three German servicemen and their German interpreter, who, since Friday, are being detained along with 3 other officers from NATO countries in the embattled eastern Ukrainian city of Slavyansk – a fourth soldier, from non-NATO member Sweden, has been released – are not participants in an official OSCE observation mission. On March 21, the deployment of the official OSCE observation mission to Ukraine had been decided to last for an initial period of six months, with ten Germans participating in the mission. The Germans being held in Slavyansk, however, are not on a mission for the OSCE, as Claus Neukirch, Deputy Director of the OSCE Crisis Prevention Center explicitly confirmed over the weekend. They were on a mission as military observers on behalf of the German Bundeswehr. They could not produce an international mandate. The Bundeswehr called their activities in the Ukraine “unusual.” The fact that they traveled into the embattled city of Slavyansk raises even more questions. The presence of German military observers in the Ukraine is formally justified with the so-called Vienna Document, which was adopted in 1990 and several times updated since. The Vienna Document facilitates arms control, obliging signatory states to a reciprocal exchange of information about their armed forces and major weapons systems, and includes verification mechanisms. It has been recognized by all 57 OSCE member states. In Germany, the Bundeswehr Verification Center (ZVBw) is responsible for coordinating all tasks arising from the implementation of the Vienna Document. The ZVBw has been collecting comprehensive information on the armed forces, particularly on those of the Soviet Union’s successor states – and the German military observers in the Ukraine are on mission for this agency. “ZVBw servicemen inspect military installations of the participating states and accompany foreign delegations coming for inspections to Germany,” according to ZVBw’s description of its habitual activities. It is based in Geilenkirchen near Aachen. NATO AWACS “surveillance” aircraft are also stationed in that town and are deployed by the western war alliance for verification flights over Poland and Romania. The deployment of German military observers in Ukraine differs in principle from the ZVBw’s previous “Vienna Document” missions, aimed at routine arms control. The mission is taking place in a dangerous conflict. This is “unusual” and “in the history of the Vienna Document, has never happened before in this form,” explained the German Lieutenant Colonel Hayko von Rosenzweig, who, from March 5 to 20, himself, had been deployed as a German military observer in Ukraine. At the time, Rosenzweig was charged with drawing up a “clear situation assessment of the activities of Russian and Ukrainian armed forces.” But his delegation was halted by separatists. The putschist regime in Kiev – a party to the conflict and a regime without democratic legitimacy – had formally requested the mission. Moreover, this mission is taking place in one of the former Soviet countries. During the upheavals 1989 to 1991, the major western powers had promised Moscow not to station any NATO troops on the territories of former Warsaw Treaty Organization member countries. This commitment – designed to maintain the military balance in Europe – has been broken by NATO countries numerous times over the past few years. The deployment of German military observers is further shifting this balance of power. Further questions are raised about the activities of German military observers in Slavyansk. Last Wednesday, Col. Axel Schneider, one of the Germans being detained in Slavyansk, first spoke in a radio broadcast about the official objectives of his mission. According to Schneider, the delegation was supposed to “make an assessment” of “the situation” of Ukraine’s armed units “and their capabilities, whether they are offense or defense oriented.” Schneider explicitly explained that the focus was “on regular, government armed forces.” There was no assignment, whatsoever, to have anything to do with separatist units or even with Russian special forces, allegedly operating in Ukraine. “We are concentrating on the security forces of the Ukraine.” However, in retrospect, the information Schneider presented on Wednesday is not convincing. He claimed he was “positively certain,” there is absolutely no “offensive posturing, possible escalation” from “Ukraine’s armed forces.” A few days later, these very same armed forces stormed Slavyansk. Still, the more important question is what were the German military observers doing in Slavyansk, in the first place, if their assignment – in accordance to the “Vienna Document” – was to solely deal with Ukrainian armed forces. Slavyansk is in the hands of separatists. This question becomes that much more volatile, since the putsch regime in Kiev apparently had explicitly coordinated its offensive on that city with Germany’s NATO partner, the USA. For example, Ukraine’s Vice Prime Minister Vitalii Yarema had not only received the head of the CIA, John Brennan, in Kiev for talks on expanding general cooperation between the secret services. According to reports, the Ukrainian partner was particularly interested in Russian and pro-Russian troop movements. It is also reported that during US Vice President Joe Biden’s visit to Kiev, Yarema had been advised by “anti-terror” specialists on the impending “anti-terror” mission (the putsch regime’s vernacular) in Slavyansk. The fact that it can be ruled out that the German military observers on mission in the Ukraine will remain silent about what they have learned, is not only due to standard procedure in similar cases. In the radio broadcast, Col. Schneider explicitly confirmed that “we have coordinated everything very closely with our Ministry of Foreign Affairs.” On the other hand, particularly in light of the intelligence service scandals over the past few years, it is not to be assumed that Berlin would withhold its information on the situation on the ground in Slavyansk – encircled by Ukrainian troops ready to storm the city – from its allies. More reports and background information on the current German policy in reference to the Ukraine can be found here: A Broad-Based Anti-Russian Alliance, Expansive Ambitions, Our Man in Kiev, Integration Rivalry with Moscow, On the Offensive, At all Costs, The Crimean Conflict, The Kiev Escalation Strategy, Cold War Images, The Free World, A Fatal Taboo Violation, The Europeanization of Ukraine and Official Government Vocative. Separatisten führen Militärinspekteure vor. www.faz.net 27.04.2014. Zentrum für Verifikationsaufgaben der Bundeswehr. www.kommando.streitkraeftebasis.de. See Von Vancouver bis Wladiwostok. Russia Could Invade Ukraine ‘Any Day Now,’ NATO Officials Warn. www.ibtimes.com 02.04.2014. Ein ganz besonderer Auftrag. www.streitkraeftebasis.de 10.04.2014. In 2010, the USA began deploying patriot units in Poland – formally rotating and for training purposes, but in fact permanently. In 2012, US soldiers were permanently deployed at central Poland’s Lask military airport. Previously, the German government had created a precedent by making the Halle/Leipzig Airport available for military use – also for NATO’s war on Afghanistan, even though the agreement between the West and Moscow also applied to the territory of the GDR. S. dazu Start in den Sommer und In den Urlaub. See Take Off Into the Summer and In den Urlaub. “Sehr überraschende Befunde”. www.br.de 23.04.2014. Reinhard Lauterbach: Streik in der Ostukraine. 9. Another German-Foreign-Policy.com article analyzes the media/propaganda component of an “op.” Presenting several stages requisite for the conditioning of a skeptical public to accept a pre-determined gambit, the article highlights the methodology of behavior modification through media presentation. The unprecedented disinformation campaign being waged by the leading German media has reached a new climax with its reporting on the murder of more than 40 people in Odessa. In the Ukrainian metropolis of a million inhabitants, the Trade Union House “caught fire” – “a catastrophe,” whose cause is still unknown. This is how it was reported immediately following the fire, on May 2. Even though supporters of the putschists in Kiev could be seen hurling Molotov cocktails at those barricaded inside the Trade Union House on international press agency photos, key German media organs chose to publish the Ukrainian intelligence services’ falsified bulletins claiming that “Moscow” was responsible for the crimes. Those murdered were among a group of demonstrators calling for regional autonomy. They had fled their attackers and were chased into the Trade Union House, blocked inside and left to a gruesome death by suffocation. Even though the context can long since be reconstructed, the “Tagesschau” evening news cast still described the scene in deliberately vague terms 24 hours later. For example, on May 3, at 20:15 the incident in Odessa was described in the First German Television Network (ARD): “The Trade Union House caught fire.” This formulation sounds like a technical defect, while avoiding linking the incident to an abundance of news material from international agencies. That “unidentified persons” may have set the fire is all that was admitted, claiming ignorance of the surrounding circumstances. Forty-eight hours later, that pro-government TV channel retreated to the prescribed terminology; “both parties to the conflict” accuse each other, making the situation unclear. After having covered, in February, the Russophobe violence on Kiev’s Maidan with elaborate live broadcasts from its correspondents, letting them from time to time be accompanied by the shrill atmosphere, today, the ARD seems incapable of doing its own research. The ARD was again on the Odessa scene, giving the putsch participant, Vladimir Klitschko the opportunity to express in an interview his regrets about what had happened and his wish that the city’s inhabitants will find more peace. This gave the symbolic figure of German interference into Ukraine’s internal affairs  to impose a hegemony over the interpretation of this crime; it has deteriorated into pastoral mourning. The television audience learned nothing about the fact that those responsible for the crime are suspected of being among Klitschko’s political associates in Kiev. Yesterday, (Sunday) – 72 hours after the murders in Odessa – the ARD ultimately had the idea of letting Arseniy Yatsenyuk, one of the most aggressive representatives of Kiev’s putschists, attempt to justify what had happened. He alleged that the police in Odessa had failed, but that those responsible for the incident are to be found in Russia (Moscow’s “Plan to destroy Ukraine”). The ARD exhaustively quoted verbatim these anti-Russian tirades on its webpage  and during a prime time photo report at 20:00, without even mentioning a second source to corroborate or contradict this propaganda. The ARD refers also to “bloody clashes,” naming no active participants or insinuating that the responsibility lies solely with the anti-government insurgents. For example, in yesterday’s 20:00 “Tagesschau,” the ARD alleged that the murders in Odessa were only the reaction to the attacks made by the victims themselves. The fact that these German military personnel were operating under a secret agreement with the illegitimate putsch regime, needing information on the deployment of insurgent forces to prepare its “anti-terror” war on Eastern Ukraine, was either considered not newsworthy or it was relegated to the nocturnal “talk shows” (“conspiracy theory”). Instead, the ARD network made a special broadcast (May 2), presenting an assumed non-partisan specialist for the OSCE thesis. On the screen, the specialist was identified as an associate of the German Institute for International and Security Affairs (SWP). He was permitted – in the course of a minute-long monologue – to confirm the version of an alleged OSCE-sponsored mission. Is espionage behind it? This question was never even raised. The television viewers were never informed that the interview partner was Wolfgang Richter, currently a Colonel, member of the Bundeswehr’s General Staff, and the section commander of these obscure military observers, whose headquarters are in Geilenkirchen, a Bundeswehr – and previously a NATO nuclear weapons – site. The ARD opened their airwaves to a disguised military officer. The masquerade of scholarship put on by the Bundeswehr in that special broadcast on public television has degenerated to the level of cold war news reporting. In the years 1962 to 1975, the ARD (including its correspondent Winfried Scharlau) and the Second German Television, “ZDF,” (including its correspondent Peter Scholl-Latour) fueled the Federal German Republic’s military readiness against Hanoi, Moscow and Peking. Vilifying the adversary – as a matter of principle – and allegedly defending the western “community of values” are part of the leading media’s standard repertoire. The large-scale war crimes committed by the USA and its allies in Vietnam, Laos and Cambodia were either not mentioned at all in news reports or dismissed as communist inspired rumors. The leading German media used a similar approach during the war on Yugoslavia and the aggression against Iraq. Three stages can be distinguished in this approach. During the first stage – the stage of preparing and conducting offensive operations – reliable correspondents with appropriate connections to military and political staffs, supervise the production of news. Correspondents and “special correspondents” in Brussels (NATO), Washington and Moscow provide the orientation. Long-time WDR journalist Rolf-Dieter Krause (nicknamed “NATO-Krause” in the WDR) is currently director of the ARD’s Brussels studio. During this first stage, which does not leave any room for skeptics, Ina Ruck (WDR) was Moscow’s correspondent and Ukraine commentator. The news reporting is hermetic and hysterical. Once the operation’s goal is within reach (or remaining obstacles seem surmountable), the informational horizon widens (second stage). In the Ukraine conflict, this second stage began when the government in Kiev was successfully overthrown in late February. The particularly gung-ho correspondents are then replaced with more liberal colleagues. Media-hype aimed at creating a public image of the enemy is replaced by a reporting aimed at calming the public. This reporting includes critics, who are welcomed (particularly in talk shows) to point out shortcoming, errors and perhaps act as prompters to propose improvements in the ongoing operation. Once this stage of the operation is ended or – due to unexpected problems – postponed, the third stage starts: A media review with, at times, startling investigative reports. This stage aims at comprehensively integrating civil society, whose pacifist skepsis or political accusations should (and must) be aired, before the next operation starts. The WDR documentary “It Began With a Lie”  following the war on Yugoslavia and – following the Maidan massacre – the WDR “Monitor” report about the alleged assassins coming from the Kiev putschist circles (“Who Were the Gunmen on the Maidan?”) are examples of this media inclusion. It becomes apparent that the reporting regional ARD stations (currently WDR), may be identical in all of the stages. They do not reflect their internal political orientations, but follow the guiding concepts of the leading personnel and the ties these have to structures of the state-supporting parties. There is massive protest against the leading German media organs’ disinformation campaign. The protest response is so strong that public television channels have had to periodically shut down the commentary functions of their internet pages, “due to overload.” In fact, the government-line press has been incapable of convincing a majority of public opinion of an inevitable military reorientation, as was bluntly demanded by the NATO General Secretary (also yesterday May 4, in the ARD) with increases in the arms expenditures. A majority of the population is also skeptical about the further encirclement of Russia, which will ratchet up the danger of war and demonstrate that the EU’s guiding principle “Peace in Europe” is a lie. The persisting intensity of their unsuccessful news reporting is the expression of a political crisis of legitimacy. More reports and background information on the current German policy toward Ukraine can be found here: A Broad-Based Anti-Russian Alliance, Expansive Ambitions, Our Man in Kiev, Integration Rivalry with Moscow, On the Offensive, At all Costs, The Crimean Conflict, The Kiev Escalation Strategy, Cold War Images, The Free World, A Fatal Taboo Violation, The Europeanization of Ukraine, Official Government Vocative and An Unusual Mission. See Our Man in Kiev and Der Mann der Deutschen. Pro-russische Kräfte attackieren Polizeizentrale. www.tagesschau.de 04.05.2014. So am 03.05.2014 auf der Internet-Seite der ARD-“Tagesschau”/”Tagesthemen”. 10. The newly-elected Poroshenko has reconstituted the old Yuschenko political team. Kiev, Jun 2 (Prensa Latina) The Ukrainian fascist party Svoboda (Freedom) demanded today that martial law be imposed in Donetsk and Lugansk regions and the borders with Russia closed. In his address during a meeting of the factions of the Supreme Rada (unicameral Parliament), extremist-nationalist Oleg Tyagnibok, leader of Svoboda, said that a military situation must be declared in the two rebel regions, where Kiev authorities have been leading an offensive since mid-April. He also urged closing the borders with Russia and eliminating the visa free regime between the two countries, a measure that has been repeatedly requested by the Security National Council, also controlled by the Svoboda party. According to Tygnibok, one of the leaders of the violent events staged in Ukraine at the end of 2013 as well as the coup d’etat in February, the bill was registered at the Rada. Battles between Ukrainian regular forces and the self-defense militia took place today in Lugansk and Slavyansk, in Donetsk, a region whose residential areas have been subjected to indiscriminate bombings from aircraft and heavy artillery. LUHANSK, Ukraine — Rebel fighters in Ukraine’s troubled east have scored a major victory, capturing a border guard command base here after besieging it for two days and then overwhelming a second base that housed Ukrainian internal security forces. Gunfire rattled for hours into the night on Tuesday as fighters surrounded the internal security base in central Luhansk, on a back street near a grocery store. By Wednesday morning, men in camouflage could be seen moving around inside the base, which goes by the number 3035, and blood was smeared in three large patches on a wall and sidewalk nearby. It was not clear how many Ukrainian personnel had been inside, but they were ordered to remove their uniforms, which lay in a pile inside the base. The Associated Press cited officials as saying six militants were killed and three Ukrainian servicemen were injured in the fighting. The military reversals came as Oleksandr V. Turchynov, Ukraine’s acting president, arrived in eastern Ukraine — the first visit by a member of Ukraine’s government to the eastern regions since separatists seized government buildings and large stretches of territory. A spokeswoman for Mr. Turchynov, Anna Vakhotskaya, said she could not give details about where he was or what he was doing, citing security concerns. In Luhansk, mourners were occupied Wednesday with burying the victims of an airstrike two days earlier. More than 100 stood in a crowded cemetery by the grave of Alexander Gizai, a respected community leader who was killed in the strike. The death of Mr. Gizai, who ran a local youth club, has angered residents. The A.P. reported on Wednesday that Mr. Turchynov, who will hand over power to President-elect Petro O. Poroshenko on Saturday, has asked the National Security and Defense Council of Ukraine to consider imposing martial law in eastern parts of the country to try to stabilize the situation. Ukraine’s first deputy prime minister, Vitaly Yarema, was quoted by the news agency Interfax Ukraine as saying that the council would convene to discuss martial law only after Mr. Poroshenko’s inauguration. Keep in mind that Poroshenko is also calling for direct US military aid under a “lend-lease” arrangement and demands a return of Crimea, so it’s pretty clear that Poroshenko is preparing to use extensive armed force against both Ukrainian separatists and, potentially, Russian forces in Crimea so WWIII isn’t exactly out of the question in terms of Poroshenko’s stated goals. And he’s the relative moderate in this situation. So will Svoboda’s calls for martial law prevail when the National Security and Defense Council meets this Saturday? We’ll see. But it raises the question of how much longer Svoboda is going to be controlling the National Security and Defense Council. Will it still be a Svoboda-controlled institution under Poroshenko’s rule? That’s unclear from the reporting, so we’ll have to wait and see about that too.